Sculptures are popping up through Glenfalloch as the garden gets ready to host a Golden Night Garden next week. A golden glow will envelop the property as Otago Peninsula Trust celebrates 50 years with Glenfalloch Golden Night Garden Sculpture Trail. Everyone’s invited to explore the lush spring garden and discover the sculptures nestled within the woodland garden which will be lit for the evenings of 27, 28 and 29 September. Glenfalloch has a proud tradition of supporting local artists; Sculptors Juliet Novena Sorrell, Josephine Regan, Bryn Jones, Philippa Wilson, Suzanne Emslie, Elizabeth Jenkins and Julie Butler have selected works to appear for the event throughout the garden. These will be complemented with lighting installations celebrating the golden theme of the Trusts 50th year. 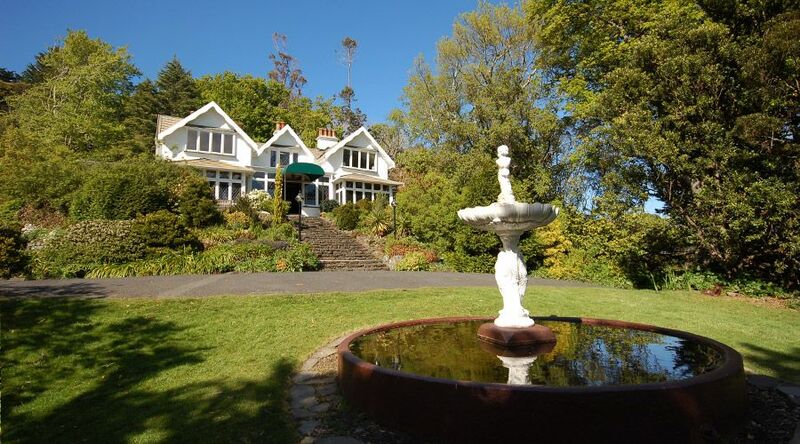 Glenfalloch was the first property saved by the Trust in the late 1960s and holds a special place in Dunedin’s hearts. The show will culminate with a Trustee and staff reunion on the Friday evening. Otago Peninsula Trust CEO Robyn McDonald says “It’ll be a gorgeous event in our garden as talented sculptors exhibit their works all splendidly lit up with golden lights. The Trust has a long history of supporting local artists at Glenfalloch so we thought this would be a perfect event to help mark our birthday. Our garden is bursting into flower with magnolias, rhododendrons, daffodils and spring bulbs all showing their spring finery. There will also be wine and food available in our restaurant, which recently achieved a top 10 ranking on Tripadvisor. Glenfalloch has certainly become a major Dunedin asset since the Trust purchased it nearly 50 years ago. We love to see locals and visitors enjoying the ambience, birdsong and exploring the garden trails; the vision of the 1967 Trustees has created an amazing place for our city to be proud of”. For those inspired by viewing the works all sculpture is for sale. The week will also see another 50th celebratory event of a reunion of Otago Peninsula Trustees and Staff at Glenfalloch. Robyn adds “We’re still trying to contact ex-Trustees and staff from our 50 year history. There’s been many hundreds of people involved with the Trust’s endeavours and we’d love for them to join us. Anyone who hasn’t heard from us should get in contact so we can send them details of the event”. Philippa Wilson is a sculptor, art educationalist and executive manager of Flower Power ltd. She has a background in secondary school teaching, holds a DFA honours, Diploma of teaching and has studied at Post Graduate level at the University of Otago. Her work is housed in national and international collections including the University of Otago, the Dunedin Public hospital, the Aquatic Centre Queenstown, the James Wallace art collection, the Aigantighe Art Gallery, the Whanganui Polytechnic, the Otago school of Fine Art. She has worked collaboratively with, the late Hon. Dr. of Literature Poet Hone Tuwhare, Keneti Muaiava (lecturer of Dance University of Auckland) Tessa Peterson (senior lecturer in violin& concert master of the Dunedin Symphony Orchestra. Emslie’s work is forever evolving as much as she is evolving as a person and as an artist……” I think I’ve experienced a huge growth in both carving in stone and building in clay – helping me find a balance and style with form”. Her work exhibited for the night garden is limestone and she uses a little exaggeration and sense of fun in the work that mostly centres round the female form – playing with the form, balance body language………….Women are gorgeous, aesthetically and sensually. They are beautiful, particularly with a few bumps and curves. Reminiscent of colonial figurative monuments, Bryn Jones’ work is incredibly life-like, in both scale and in rich detail. His sculptures have a sense of the figure caught in time and resting, as if reflecting on the past and at the same time pensive about the future. Jones is an artist whose work can be found in public and private collections throughout New Zealand, his most notable public sculptures include the bronze of Sir Edmund Hillary at Mt. Cook, the bronze of Pelorus Jack at French Pass, the Sea Lion at St Clair and the bronze Cedar cone at the Dunedin Botanic Gardens. He studied at Otago Polytechnic School of Art, where he received an Honours Degree in Fine Art, and he has been practising as an artist since 1990. Jones is also Head of Department, Visual Arts at John McGlashan College. Josephine has a background in Occupational Therapy and working with Artsenta in Dunedin. Her most recent work includes fine, slip-cast porcelain, and 6 large cast-concrete sheep for Vogel Street. For Glenfalloch Night Garden she is exhibiting works in marble, limestone and ceramic. Butler has always been interested in manipulating materials but none so much as clay. She explains “This fascinating material pushes me to my limits as I push it to its. I fire my sculptures in a large gas kiln using a reduction techniques and use glazes that I have evolved over the past thirty years and after much experimental work. My subjects vary depending on my environment at the time of making, and my works range from whimsical abstracts to highly realistic pieces”. Juliet Novena Sorrell lives in Dunedin and has a studio practice as a visual artist working within the disciplines of drawing and sculpture. She also incorporates her work into performance and community art projects and is a secondary and tertiary art educator. Juliet’s work has been collected and exhibited extensively throughout New Zealand. Juliet combines a range of materials including metal, ceramic, perspex, fabric and charcoal drawing to create her sculptures. Her work uses motifs of figures, birds, cages and plant or animal forms to create intriguing and unique sculptural works. Jenkins is a Dunedin artist and gardener whose love of flowers features in her paintings, her work as a wedding florist and also features in the food that she cooks. The garden is close to her heart, being a volunteer member of Glenfalloch Garden’s ‘Friends of the Garden’ group.